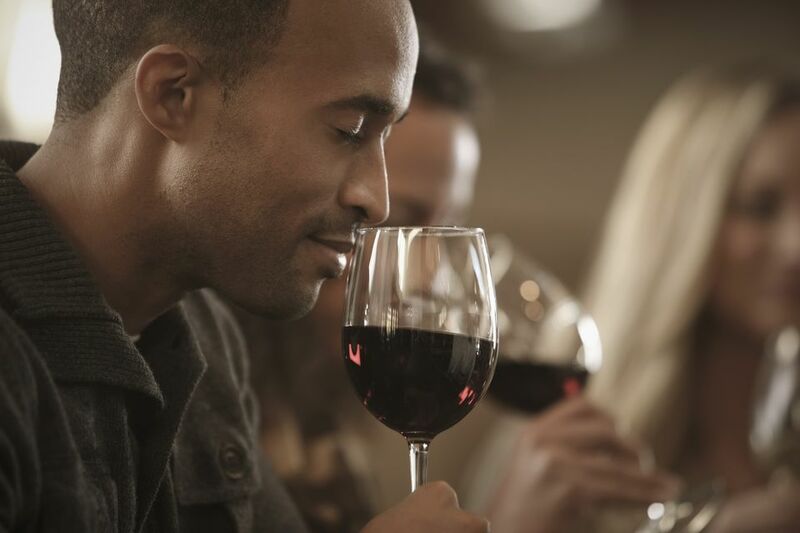 In general, a wine's "aroma," or "nose," is the smell of the wine in the glass. The aroma can be floral, citrus, fruity, vegetal, earthy or any number of familiar scents depending on the grape variety used, the winemaking process implemented and the wine's storage conditions. When it comes to wine, both tasting and smelling, the nose is mission critical. The human nose is capable of differentiating between thousands of unique scents. It's our olfactory abilities that allow us to discern the sheer variety of flavors that are offered up in a single sip. Meanwhile, the tongue is limited to sensing: salty, sweet, bitter and sour. To truly taste a wine you will need to recruit the nose to pick up the flavor scents and the tongue to help discern the tastes and textures. To get the best whiff of the wine's aroma, spend a good 10 seconds swirling the glass with some vigor. This allows the alcohol to volatilize and will lift the wine's innate scents towards your nose. Once the wine is well-swirled stick your nose into the glass and breath in. What scents come to mind first? Flowers, fruits? If fruit, drill down a little deeper, are you smelling red or white fruit themes, orchard fruit or berries, or possibly more exotic tropical notes? Keep these scents in mind and see if they reappear on the flavor profile or morph into new delights on the palate. Primary aromas are those distinct smells that are derived from the fruit itself. These aromas may present themselves as fruity or floral in nature. It's these aromas that allow us to differentiate between different wines in their youth. Violets, rose, chamomile, green apple, lemon-lime citrus, black and red berries would all fall under the primary aroma category. The fermentation process creates a wine's secondary aromas and may be subtly or significantly influenced by the winemaker's choices. The most common influence in secondary aromas is oak. From imparting nutty, buttery, vanilla and cedar or other wood-like themes to a final wine, oak's lofty influence is the dominant factor in a wine's secondary aromatic profile. If a wine has undergone some sort of aging process, then tertiary aromas may start to set in. The longer and more extensive the aging, the more a wine's aromatics will be influenced by these tertiary aromas. These often include oxidative character traits like coffee, caramel, toffee, and cocoa or reductive notes that lean more towards earthy nuances like the damp scents of a wet forest floor, mushrooms or veggie-like components. If a wine is fermented and aged in stainless steel tanks without a hint of oak in sight, then these wines will come across quite youthful and fresh, full of fruit and be dominated primarily by primary wine aromas. If however, a winemaker is running Chardonnay through a secondary fermentation known as malolactic fermentation the resulting in a wine will carry rich, butter-based smells. These buttery scents specifically come under the nose category of "bouquet" not "aroma" because they would not be present in a Chardonnay that has not undergone malolactic fermentation, an intervention used by the vintner and not innate in the grape's varietal character. What Is Malolactic Fermentation of Wine?